I watch a lot of TV. If you're reading this, I assume you do too. It's hard to surprise us. By necessity, shows often follow a formula of sorts. There are thousands of tropes to trip across and try to make fresh. Things can come predictable. That's what I was planning to say about Code Black Season 2 Episode 13. I mean, I was literally saying lines just before characters did. But just as I started mentally planning a two thumbs down review, a miraculous thing happened. "Unfinished Business" would have been good no matter what, I'm sure. We got deep insight to a beloved doctor from a show that is typically more "trauma(s) of the week" than character driven. But taking the mundane predictability and then turning it against viewers was genius. It was frustrating up until the big reveal, and in retrospect, that seems like a gamble. By having cases (and lines) be so foreseeable, how many people tuned out before the third act? As previously discussed, ratings have been flagging. A shakeup was definitely needed, and I can only hope that the risk pays off and shocks Code Black off of life support. I'd quit this place if I could...but I can't. Permalink: I'd quit this place if I could...but I can't. Other than giving viewers a superbly innovative hour of television, "Unfinished Business" allowed the writers and actors to play with characters in a relatively safe space. Nothing other than the last 10 minutes or so really occurred. It was all just in Rollie's head. Of course, this means that we should view all of the characters actions and behaviors as how Rollie sees his peers as well as himself. Was Noah treating baby Adira because he physically resembled Rollie, or because Rollie feels an existential kinship with the intern? Angus and the senior attending have always had a close relationship, but the young squire was making pretty ineffectual arguments to suicidal Tracy. At the time, I was annoyed – ER docs should really have better skills to interact with the mentally ill.
Elliot: I'm sorry, I can't -- I can't do this. Rollie: Elliot, listen to me. Do you know why you're good at it? Because they're not your patients. They're you. But was Angus' inability to relate to the patient Angus' inability, Rollie's perception of Angus' inability, or Rollie's own inability? 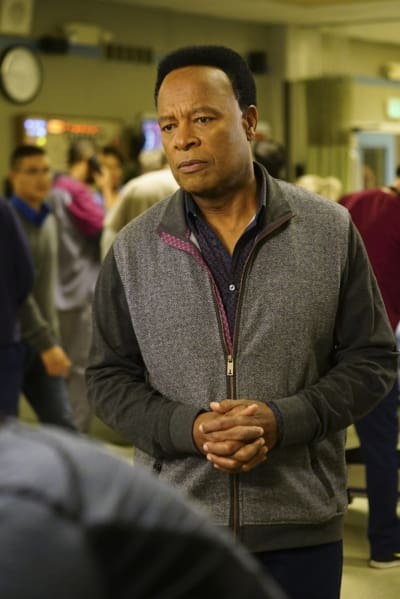 As we digest Code Black Season 2 Episode 13, Inception level headaches loom. It's probably best not to over think it, but that's just not in a Fanatic's nature. Outside of the sublime plotting of "Unfinished Business," I was absolutely tickled that Cress Williams returned. My only criticism would be that there maybe needed to be a "previously on" intro to jog the memory for some viewers. 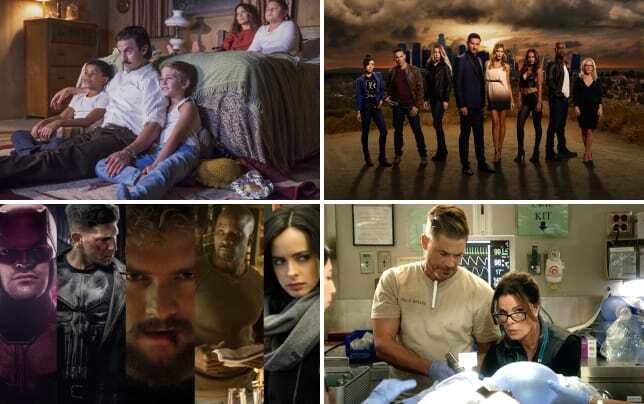 It may have given up the ghost, but newer or casual viewers need that connection for the story to be complete. The montage of scenes at the church in Rollie's head was beautiful, but may have been confusing for those who don't obsessively remember minor details. Emmanuel: My daughter and I, we've been at odds with each other lately, and I was just asking God for guidance. Rollie: And did you get an answer? Emmanuel: He said if raising children were easy, he might've had another. Permalink: He said if raising children were easy, he might've had another. I hope that Williams' return isn't a one off. 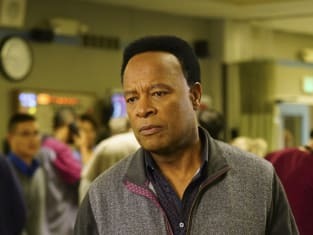 I don't expect to have him back as a regular anytime soon, but his departure from Code Black Season 1 was far too abrupt, and Rollie's recovery and their reconciliation opens the door for some more visits. We never did get a real resolution to his aborted romance with Leanne. And having him and Campbell in the same OR would be something – I can't decide if they'd get on like gangbusters or just continually posture at one another in some kind of territorial battle of wills. You're human. And humans want answers. The answers you need don't come with photographic evidence. They require that you believe in something you can't see. After all, that's why we call it faith, isn't it? Otherwise we'd call it proof. We'll have to wait and see if the prodigal son returns once more. Code Black Season 2 Episode 14 ("Vertigo") will focus on Mario and Ethan's field trip to a construction site. I swear, they need to put the colonel on a leash or something! With Mario coming off a double shift (naughty boy), things get dicey when the docs have to treat the patient 300 feet above the ground. Will this finally make Ethan reconsider the risks he takes? If the situation with Mike didn't, I'm not sure this will. Back at the ranch, Leanne treat's the wife of a colleague from the ortho department who comes in with "mysterious injuries." The obvious conclusion is domestic abuse, but we all just had a great lesson in the danger of making assumptions, didn't we? Lola: "Some healing to do." That's my father's line. Pops up all the time in his Sunday sermons. Ethan: Well, there's a fine line between faith and medicine. Lola: Are you a man of faith, Dr. Willis? Ethan: I have faith in medicine. Permalink: I have faith in medicine. If you only watched "Unfinished Business" once before deleting it from your DVR, I can't recommend that you watch Code Black online for a second time highly enough. You'll appreciate the writer's skills even more the second time around. What did you think of the different approach taken with this one? Share you thoughts in the comments section! Elizabeth Harlow was a staff writer for TV Fanatic. She left the organization in October 2018. Rollie: Approximately six months old, a female... Do I really have to describe an infant to you?! Tell you what, just bring me whatever babies you find. How's that? Permalink: Approximately six months old, a female... Do I really have to describe an infant to you? !